UPDATE NOVEMBER 15 12:26AM: Uddin has been released from the hospital. She is now being held without bail in the Cook County Jail. Mugshot added. 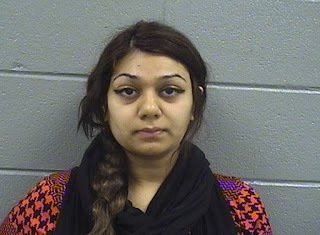 A 19-year-old Uptown woman is facing first degree murder charges today for allegedly throwing her newborn baby girl out of an 8th floor apartment window late Wednesday night. Police sources have identified the woman as Mubashra N. Uddin of 850 W. Eastwood Ave. The newborn girl was found clinging to life on a patch of grass outside of that address around 11:45PM Wednesday. She died an hour later. Uddin is currently under police guard at Illinois Masonic Medical Center, a source said. Detectives took Uddin into custody at 6:50PM on Thursday. Three hours later, police personnel conducting a consensual search of her apartment were seen taking a king-size mattress from the building as evidence. Police sources say the motive in the killing was family opposition to the pregnancy because the child was mixed-race. The mother is of East Indian descent; the father, African American. Police continue to investigate the case to determine if others were involved. The baby's death was Uptown's 11th homicide of 2015.